Brickley (or Byrkley) Lodge was named for the local aristocratic family the de Berkleys, but was originally built for Hamar Bass, founder of the Bass brewery. The lodge is set in Needwood Forest, which was established in the 13th century as a chase for hunting, and covered a large swath of East Staffordshire. 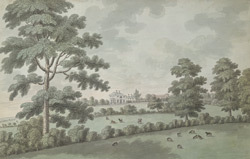 Byrkley Park, which had a hunting lodge, fish pond and open parkland, was part of this chase. In the late 18th century, the medieval hunting lodge was superseded by a new Georgian building designed by Sir Robert Edis. The surrounding park land and ponds were landscaped. This Georgian lodge has since been pulled down.